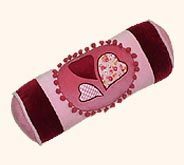 This is a special designed product with triple heart shape at the center of the cushion, pillow and bolsters. Gift your kid with this cushion and see the happiness in his/her face. This particular item is in great demand in the market. Our pillows and cushions are very durable as they are stitched with the best available machinery. 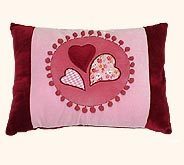 Desc : Embroidered with the exquisite patterns of three hearts, this pink & maroon colored cushion is sure to be favorite of the kids. 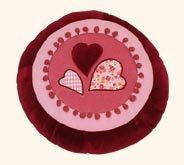 Desc : Embroidered round cushions are decorated with RI-heart designs as well as three concentric circle patterns of different colors. 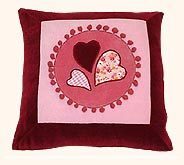 Desc : Rectangular shaped this hand embroidered cushion is deliberately colored in pleasing shades of red, pink & maroon to cheer up the babies. 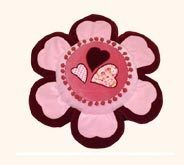 Desc : These striking embroidered bolsters are furnished with adorable heart designs on smooth fabric to provide the kids touching & viewing pleasure. Desc : These intriguing flower shaped pillows can be gifted to small children. The stunning shape & designs of these pillows tempt all the kids.